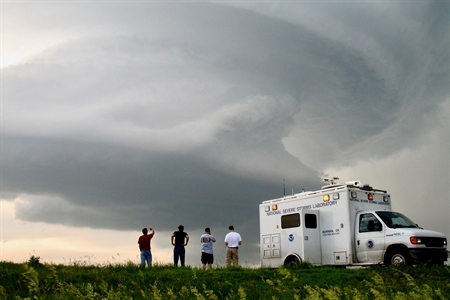 NOAA’s two primary short-range weather models received upgrades developed by NOAA researchers that will provide more accurate hazardous weather and aviation forecasts as they roll into operations (July 12) for the National Weather Service’s Storm Prediction Center, other national forecast centers and local forecast offices across the country. The hourly-updating High-Resolution Rapid Refresh model (HRRR) and its “parent” model, the Rapid Refresh model (RAP), work hand-in-hand to provide the foundation for many of the forecast products issued by the NWS every day. The biggest changes came to the HRRR, NOAA’s 3-kilometer resolution storm-resolving model, which will provide more accurate predictions of thunderstorms and flooding potential more than a day in advance. The forecast area also has been expanded to include Alaska, where the primary mode of transportation is aircraft, and predictions of small-scale details on clouds, visibility, and icing are vital for pilot safety. The RAP and HRRR were conceived and developed by NOAA’s Global Systems Division, the weather-forecasting R&D arm of the Earth System Research Laboratory in Boulder, Colorado. NOAA’s National Centers for Environmental Prediction (NCEP), including the Environmental Modeling Center and NCEP Central Operations, worked closely with GSD to evaluate and implement the model into real-time operations. An experimental version of the HRRR, dubbed HRRRx, is run continuously at GSD to demonstrate, in real time, scientific advances before they are implemented into the NOAA operational model. The next set of GSD upgrades to the RAP and HRRR are due in 2019. 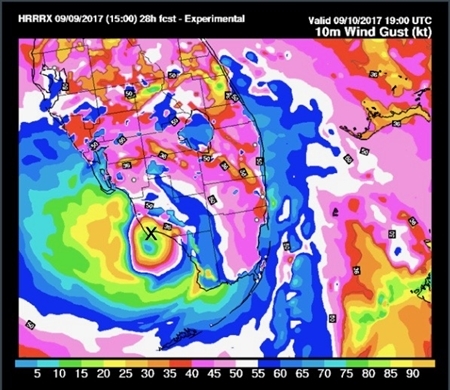 The 36 hour HRRRX forecasts accurately predicted Hurricane Irma’s location within a half county and captured the timing and landfall over Marco Island, Florida at 2pm on Sunday, September 10, 28-hours in advance. The new version of the HRRR doubles the forecast period from 18 to 36 hours - the “Day 2” period that is critical for constructing severe weather outlooks. Extensively tested during the past year - including last year’s hurricane season - this second upgrade of HRRR provides additional lead time for potential flooding, rotating thunderstorms (known as supercells), damaging winds, hail, and blizzard conditions. The HRRR also ingests measurements taken by commercial airliners, improving wind, turbulence, cloud-top and cloud-ceiling predictions that are vital for routing planes around storms and for aircraft safety during take-offs and landings. The HRRR is nested inside the more expansive RAP, NOAA’s short-term,13-kilometer resolution model covering the entire North American continent and then some. 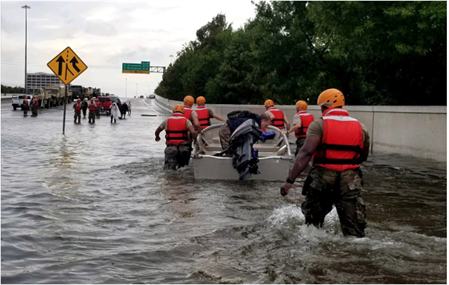 The RAP is an anchor for tactical forecasting in the United States, including decision-making related to severe weather, aviation, and renewable energy. The new RAP also delivers improved aviation forecasts and extends forecast periods out to 39 hours from the previous 21 hours. The National Severe Storms Laboratory in Norman, Okla. is using the HRRRx to actually predict the formation of supercells, offering earlier and more accurate warnings for tornadoes and severe weather. Beyond operational forecasts, the HRRRx has been adopted by NOAA research meteorologists, physicists and chemists as a primary tool supporting development of a number of weather and atmospheric forecast applications, said Stan Benjamin, senior scientist for GSD. Almost a dozen operational and experimental models developed by NOAA research depend on the weather information from RAP and HRRR, including the National Water Model, air quality, aviation models, and even an analysis of the weather every hour. “The HRRR is so useful in a myriad of forecast applications because it does such a good job representing all aspects of the weather -- wind, precipitation, clouds, thunderstorms, even smoke, and how they evolve together in the atmosphere,” Benjamin said. HRRRx provides the precipitation modeling for a state-of-the-art prototype runoff and flooding prediction system NOAA’s Physical Science Division (PSD) and several partners are building for the nine-county San Francisco Bay area. The project is due to be complete in 2021. HRRRx is employed by PSD’s Colorado-New Mexico Regional Extreme Precipitation Study, whose goal is to improve extreme precipitation estimates to enhance dam safety and community resilience in the Southern Rockies. HRRR-Ensemble initializes the Warn-on-Forecast model being developed by NOAA’s National Severe Storms Lab in Norman, Okla. to allow forecasters to actually predict the formation of supercells, offering earlier and more accurate warnings for tornadoes and severe weather. Currently, the National Weather Service issues tornado warnings after rotation is detected by radar or observers. HRRR-E is one of the models used in NOAA’s Hazardous Weather Testbed Spring Forecasting Experiment to evaluate the applicability of cutting-edge tools in a simulated operational environment. Model developers and forecasters work together to investigate the use of convection-allowing model forecasts as guidance for the prediction of hazardous convective weather. GSD scientists have shown a 15 to 25 percent improvement in HRRR wind forecasts at the height of wind turbines, depending on weather conditions. GSD scientists also recently showed how the HRRR’s off-shore wind forecasts can help identify the best areas to investigate for off-shore wind farms. GSD scientists are demonstrating how the HRRR can help grid operators calculate the thermal effect of sunshine, temperature, and wind on high-voltage power lines, allowing operators to maximize energy transmission within safety margins. HRRR-Smoke is a model application designed to accurately forecast conditions that dictate the direction and height of wildfire smoke plumes, important information for public health officials - and for land managers assessing whether or not to proceed with a controlled burn. Researchers are also developing the capability to forecast ash transport, critical for aircraft safety. Experimental HRRR-smoke forecasts are available online.